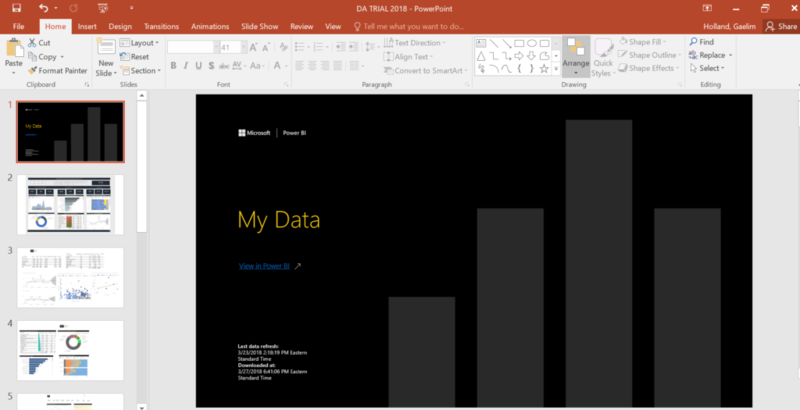 Power BI has a great function that allows you to export your visuals directly to a Power Point presentation. However, to be able to achieve this, you need to have a Power BI online account so that you can publish your Power BI workbook to the web. 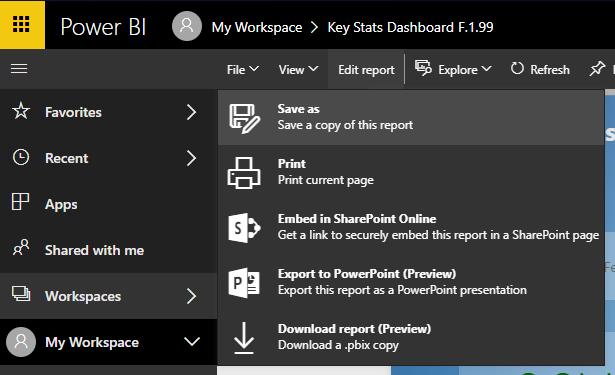 You can follow the instruction below which will detail how to transform your Power BI visuals into a beautiful slide show presentation. 2. Choose a Report or Dashboard. Once the export is done, you will have access to the each visual in your report. You can easily copy and paste these to recreate the look and feel. You can check out your exported file that each report tab will be a separate slide. The first page will be a title page for document which will have and the other will be visuals. You should consider creating each visual on each page of your report if you would like to have these an individual elements that you can copy and page. If not, all the visuals will be aggregated into one single image.